Timber construction is all the way back again ! In the middle ages, wood was the most widely used construction material. Only large buildings, such as churches, castles and monasteries, were made of brick. In the early 1900s, however, timber disappeared in a relatively short period of time within the housing construction. But wood is all the way back again, wood lives and the interest for timber construction is growing! Building sustainable homes with sustainable materials and the healthy living climate in a wooden house are important aspects. There are even whole neighborhoods within municipalities where one may build only with wood. And that we notice very well. The interest for our Cedar wooden houses and other applications is growing steadily. Cedar wood is of course known for its excellence and sustainable properties: it is and remains free of rot, mold and insects; it is light of weight; based on the compact cellular wood isolates excellent in a naturally way, it smells delicious and the red cedar has a beautiful, warm appearance. But we still put a scoop on top. With our patented construction method our products can be built very quickly and they are ideal for self construction. This saves enormously on manpower and therefor on money. Zelfbouw door geïsoleerde bouwmethode is kinderspel. Is innovation in timber construction possible? YES!!! Since timber construction is so old already, you wonder whether innovation than is still possible. 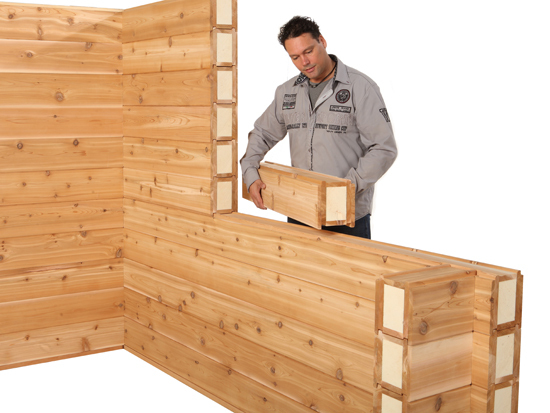 But here Eurologs also comes with a novelty: Thermo lam III, a cedar wooden construction element equipped with integrated insulation. By this method you only place one wall, in which the insulation material already is processed within. This saves you at least 50% construction time at construction of exterior walls of a building and simultaneously it creates more space on the inside. And such a Thermo Lam III-wall outperforms construction decision. 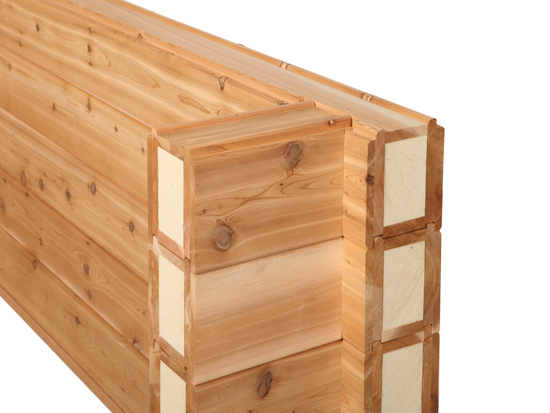 When building cedar wood applications this again saves on production time and therefore money.